^ "New Eddie Vedder Record and DVD Coming May 31". pearljam.com. Retrieved March 21, 2011. ^ "Eddie Vedder Solo Album 'Ukulele Songs' Due In May". billboard.com. Retrieved March 21, 2011. ^ Poseur, Nameless (April 25, 2011). 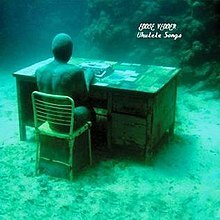 "Eddie Vedder Reveals Ukulele Songs Album Art • News •". Exclaim.ca. Retrieved July 12, 2011. ^ Mikael Wood (May 25, 2011). "Ukulele Songs review – Eddie Vedder – Pearl Jam Review | Music Reviews and News". EW.com. Retrieved July 12, 2011. ^ "Eddie Vedder 'Ukulele Songs': Track-by-Track Review". Billboard.com. September 14, 2009. Retrieved July 12, 2011. ^ "Album review: Eddie Vedder's 'Ukulele Songs' – latimes.com". Latimesblogs.latimes.com. May 31, 2011. Retrieved July 12, 2011. ^ "Album Reviews: Eddie Vedder: Ukulele Songs". Pitchfork. June 1, 2011. Retrieved July 12, 2011. ^ Hyden, Steven (July 5, 2011). "Eddie Vedder: Ukulele Songs | Music | Music Review". The A.V. Club. Retrieved July 12, 2011. ^ "Eddie Vedder Performs New Tracks, Pearl Jam Deep Cuts at Solo Acoustic Show". Rolling Stone. Retrieved July 12, 2011. ^ "Eddie Vedder Solo at Detroit's Fox Theatre Review – An Alternative Performance". lasplash.com. Retrieved July 12, 2011. 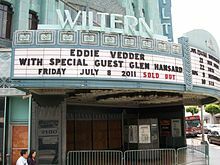 ^ "Live review: Eddie Vedder at the Wiltern". LA Times. July 10, 2011. Retrieved July 12, 2011. ^ "Pearl Jam frontman ventures across the south beginning April 11". billboard.com. Retrieved March 12, 2012. ^ "Eddie Vedder Postpones US Solo Tour Dates". pearljam.com. Retrieved April 6, 2012. ^ "Eddie Vedder announces first-ever UK solo shows". NME. Retrieved March 12, 2012. ^ "Australiancharts.com – Eddie Vedder – Ukulele Songs". Hung Medien. Retrieved November 6, 2016. ^ "Austriancharts.at – Eddie Vedder – Ukulele Songs" (in German). Hung Medien. Retrieved November 6, 2016. ^ "Ultratop.be – Eddie Vedder – Ukulele Songs" (in Dutch). Hung Medien. Retrieved November 6, 2016. ^ "Ultratop.be – Eddie Vedder – Ukulele Songs" (in French). Hung Medien. Retrieved November 6, 2016. ^ "Danishcharts.dk – Eddie Vedder – Ukulele Songs". Hung Medien. Retrieved November 6, 2016. ^ "Dutchcharts.nl – Eddie Vedder – Ukulele Songs" (in Dutch). Hung Medien. Retrieved November 6, 2016. ^ "Lescharts.com – Eddie Vedder – Ukulele Songs". Hung Medien. Retrieved November 6, 2016. ^ "Offiziellecharts.de – Eddie Vedder – Ukulele Songs" (in German). GfK Entertainment Charts. Retrieved November 6, 2016. ^ "Greekcharts.com – Eddie Vedder – Ukulele Songs". Hung Medien. Retrieved November 6, 2016. ^ "Italiancharts.com – Eddie Vedder – Ukulele Songs". Hung Medien. Retrieved November 6, 2016. ^ "Charts.org.nz – Eddie Vedder – Ukulele Songs". Hung Medien. Retrieved November 6, 2016. ^ "Norwegiancharts.com – Eddie Vedder – Ukulele Songs". Hung Medien. Retrieved November 6, 2016. ^ "Portuguesecharts.com – Eddie Vedder – Ukulele Songs". Hung Medien. Retrieved November 6, 2016. ^ "Spanishcharts.com – Eddie Vedder – Ukulele Songs". Hung Medien. Retrieved November 6, 2016. ^ "Swedishcharts.com – Eddie Vedder – Ukulele Songs". Hung Medien. Retrieved November 6, 2016. ^ "Swisscharts.com – Eddie Vedder – Ukulele Songs". Hung Medien. Retrieved November 6, 2016. ^ "Eddie Vedder | Artist | Official Charts". UK Albums Chart. Retrieved November 6, 2016. ^ "Eddie Vedder Chart History (Billboard 200)". Billboard. Retrieved November 6, 2016. ^ "Canadian album certifications – Eddie Vedder – Ukulele Songs". Music Canada. Retrieved December 3, 2018. This page was last edited on 3 December 2018, at 20:49 (UTC).